Tenax IRISH MAT synthetic lawns are made of high-quality virgin materials without heavy metals and they feature a high natural effect. They are made of High Density Polyethylene (HDPE) and Polypropylene (PP) synthetic blades stitched onto a draining backing which ensures a strong anchoring and the drainage of excess water. Indeed, on the backing at the base of the lawn, there are holes that drain water effectively (drainage capacity: 60 l·min/m²). 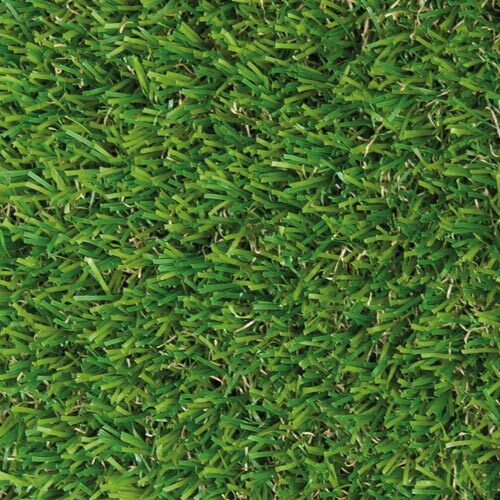 These synthetic lawns are long-lasting and heavy-duty and their colour is guaranteed for 8 years. Once installed, your synthetic grass will be beautiful and perfect for a long time. IRISH MAT 25 has tufts of fibres in multiple shades of green, so the lawn seems real. Its medium-height yarn, always neat and orderly, gives the product a natural look, making it the ideal solution for public places. Always green and resistant to weather elements in any season, the artificial lawns of the IRISH MAT Line are perfect for renovating gardens, terraces and balconies while offering original and very stylish solutions for a green area in unexpected zones, such as the interior of houses, projecting roofs, roofs and basement windows. Thanks to its chlorine resistance and to the low maintenance it needs, synthetic grass is an ideal and beautiful solution for restaurants, hotels, public places, but also playgrounds and gardens, where it is used in an original way to create carpets for outdoor areas, runners or poolside. Maximum natural effect: Guaranteed by the optimal choice of colour shades and to the shortest PP yarns, brown like roots, that increase the natural look. Excellent “SPINE SHAPE” resilience: Yarns have an excellent shape memory (they stay upright). Sand infilling considerably improves this feature. Learn more about the IRISH MAT Line: advantages, answers to all your questions or some useful advice for a correct care and maintenance of your synthetic lawn. TENAX offers resellers display solutions both for self service (display stands for mini rolls) and for assisted sale with bulk rolls. Lawn displays and totem displays show all the advantages of the Tenax IRISH MAT range supporting sales, while consumers can see the high quality and natural effect of TENAX artificial lawns first-hand thanks to samples. Installing a synthetic lawn is quite simple, so you can do it autonomously on a small surface but it is better to call a skilled professional (gardener) for more complex installations (large surfaces, numerous cuts and joints) that require particular ability. TENAX has created a video tutorial and simple guidelines that explain step by step how to install your turf in the right way, distinguishing between the installation on the ground and on a floor. Go to the “Installation” section or watch the video tutorial below.